Three children kidnapped after their mother was killed in a remote area outside Los Angeles were found safe Wednesday as authorities continued to search for the couple wanted in connection with both crimes. Joshua Aaron Robertson, 27, and Brittany Humphrey, 22, fled the Los Angeles area with the children on Interstate 40, and drove through Arizona and into New Mexico, according to the Los Angeles County Sheriff's Department. The children, two girls and a boy between 2 and 5, were found safe in a motel on the outskirts of Albuquerque after the couple left the children with a good Samaritan, the sheriff's department said. That's nearly 700 miles east of where the children's mother was found dead with multiple gunshot wounds along a road in a remote area of Los Angeles County on Aug. 14. 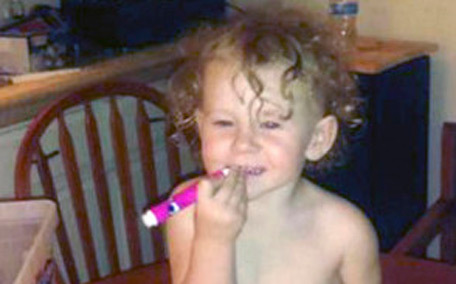 Their mother, who didn't have identification on her body, was identified four days after her death as Kimberly Harvill. The sheriff's department still considers Humphrey and Robertson as on the run and armed and dangerous. Investigators believe they were headed to parts east of New Mexico. The couple has family in Nebraska, and ties to Kansas, Louisiana and Mississippi, said Lt. Joe Mendoza. Sheriff's officials say Robertson has an infant with him who is unrelated to Harvill's children, who were in the custody of authorities working to return them to California. The children's father died previously, but they have a grandmother in Fresno, authorities said. Harvill and her children most recently lived in Fresno and were transitory, moving from motel to motel, sheriff's Capt. Steve Katz said, adding that they depended on panhandling to get by. Harvill was involved with meth, as were Humphrey and Robertson, Katz said. He said it's unclear whether Harvill and her children were staying with Humphrey and Robertson before the killing. Mendoza said investigators knew of no ongoing conflict between the sisters. An arrest warrant for kidnapping was issued for the couple. Investigators say the couple are considered persons of interest in Harvill's death. The couple is believed to be in Harvill's 1999 green Ford Expedition, which has California plates 7BEK024 that may have been swapped for temporary paper tags, stick-figure stickers of a family and a sticker that reads "R.I.P. Chad Watkins." Robertson has a criminal history that includes a conviction on illegal weapons charges and is on probation.